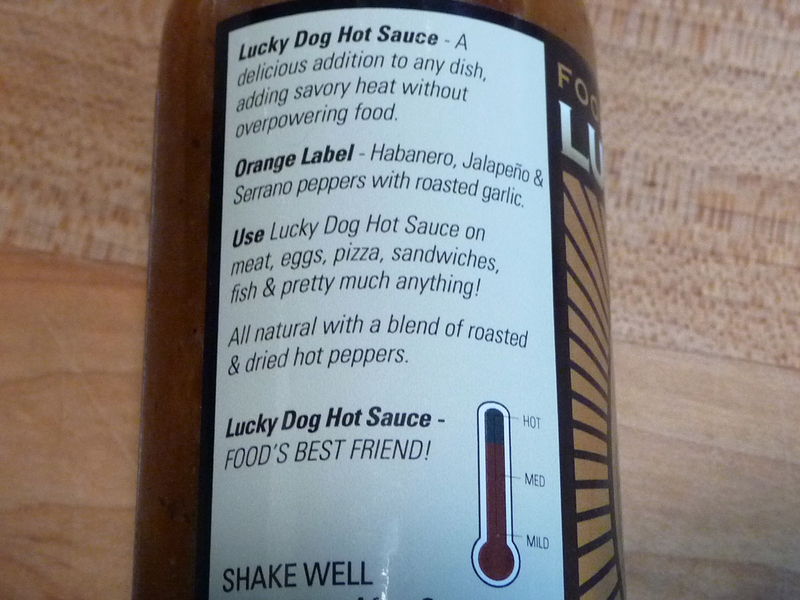 Lucky Dog Hot Sauce – “Food’s Best Friend”, comes from the Sonoma, California kitchen of Scott Zalkind. 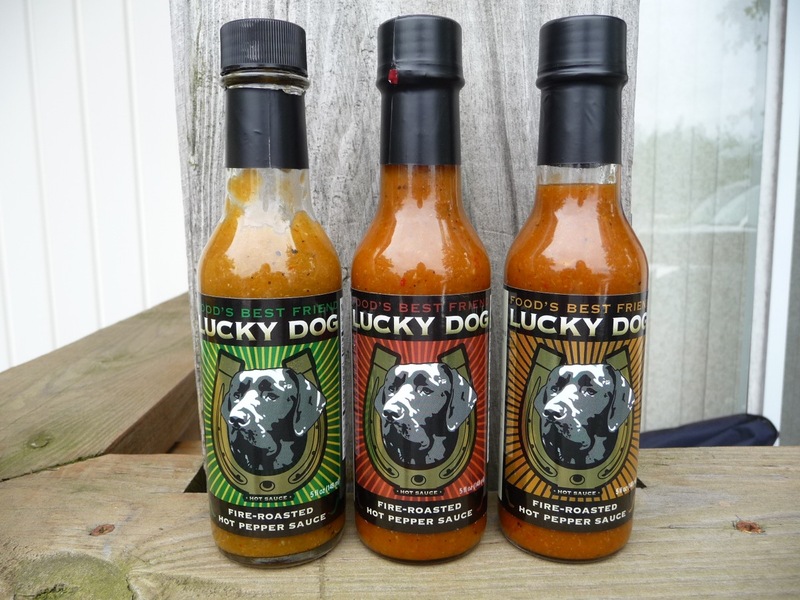 Featuring fire-roasted hot peppers, Scott offers three versions of Lucky Dog Hot Sauce. Green Label – with jalapeño, serrano and cayenne peppers, and roasted garlic – is the mild-to-medium version. Red Label – adds habanero to the jalapeño, serrano, and cayenne pepper mix – this is their medium-hot offering. Orange Label – more habanero, serrano, jalapeño and varietal hot cayenne peppers – Orange Label is their hot one. I’ve been in touch with Scott since March of this year, and at that time he was finishing up pre-production work on Lucky Dog. Having just launched officially in June of 2012, Lucky Dog is the “new kid on the block”, and I’m glad they brought out all three flavors right off the bat. Their site, LuckyDogHotSauce.com mentions that upcoming fourth, and possibly fifth flavors are in the works. Ingredients: distilled vinegar, onions, roasted chile peppers, roasted garlic, water, carrots, chile peppers, sugar, sea salt, lime juice from concentrate, cayenne pepper The side of the label does spell out the peppers here are the jalapeño, serrano and cayennes. Texture & Appearance: With finely ground or crushed peppers and slightly thick, this sauce pours in dollops and clings well. 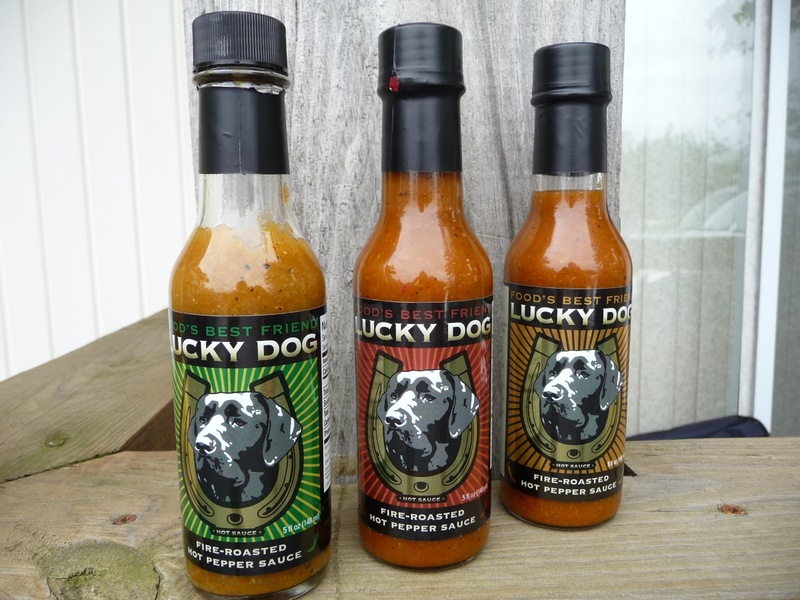 Marilyn says “the color is a dull orange / beige – not really green.” The overall texture of all three of the Lucky Dog sauces is the same impressive and consistent grind. Very nicely done! Taste Straight Up: Sweetness from the carrots and sugar is up front along with the onion. The jalapeño and serrano peppers provide a mild, traditional heat on the front of the tongue. This is a classic flavor enhanced by the quality of the ingredients. The smoked roasted peppers provide a nice earthy flavor overall. However, the garlic is disappointingly too subtle for me. I love to be hit in the face with garlic… Marilyn, not so much. Knowing there are dried chile peppers buried in the mix, I can’t help but sense just a wee bit of what I call “dustiness”. It’s ever so slight, and it may be a “mind thing”, as Marilyn disagrees with me. But I thought it worth mentioning. Heat Level: – A fairly good bite of heat that tingles the tongue, but is short lived – I credit the serranos for the nice sting here, even if it’s only a mild-medium level, just as the label says. Ingredients: apple cider vinegar, onions, roasted chile peppers, carrots, roasted garlic, water, chile peppers, sea salt, sugar, cayenne pepper, lime juice from concentrate Again, elsewhere on the label the addition of habaneros are mentioned. Texture & Appearance: A tab bit thicker than the Green Label, with a darker burnt orange color. Same great “grind” or mash-like consistency. 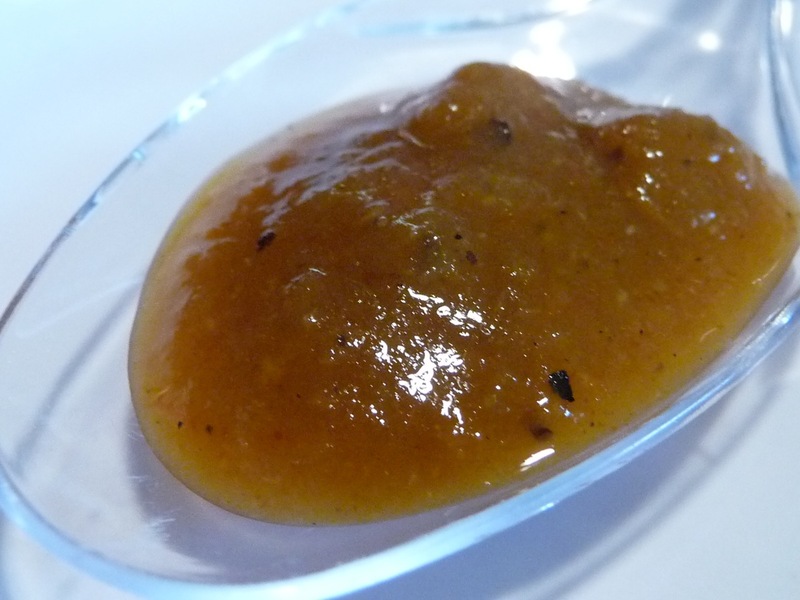 A beautiful sauce, if you can call anything that looks burnt orange, beautiful. I’m smitten with the texture of these 2 sauces. Taste Straight Up: The habanero really shines through at first, bringing on its classic taste – fruity and hot – followed by the sweetness of the other non-chile ingredients. We think the roasted garlic, being much sweeter than its raw counterpart is a supporting player in the sweetness here. It’s also a little more pronounced now. Heat Level: – Yup, just barely a notch above the Green Label here. Marilyn thinks it’s practically the same heat level, but with a different chile. In this case the habby moves the burn to the back of the throat. I think the fire roasting technique, along with the milder apple cider vinegar, really keeps the heat from burning too much. 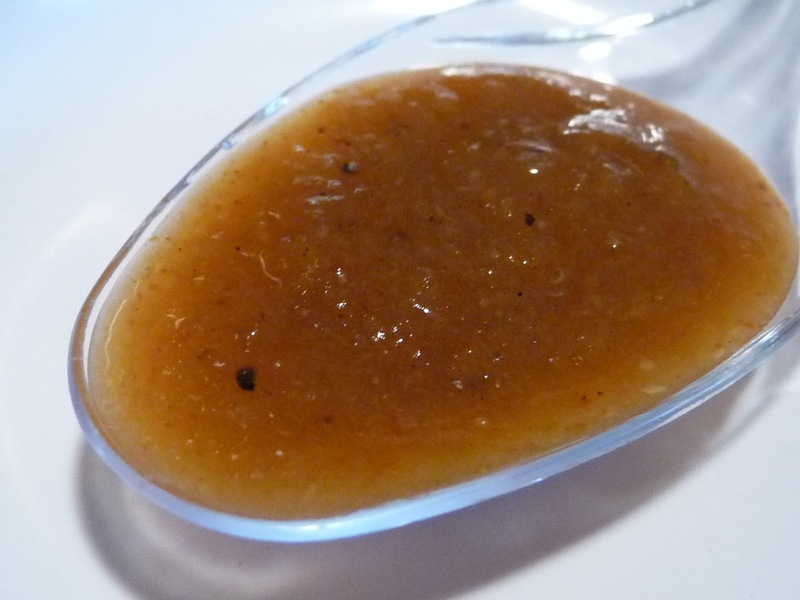 The rich, sweet flavor is still predominant, making this sauce a great, well balanced choice. Texture & Appearance: We’re back to the slightly thinner consistency, very similar to the Green Label, if not just a bit thinner. Also it’s the darkest color of the 3, but we’re still in burnt orange territory. And again, the overall grind or consistency is standard for Lucky Dog. Taste Straight Up: We both detected a rich, dark smoky flavor here. Finally, the roasted garlic comes through stronger for my taste. Marilyn commented the vinegar flavor is more pronounced for her. Heat Level: – Only moving up 1 star in heat, the Orange Label does have the same ingredients as the Red, only the order of a few have shuffled around. I’m assuming, of course, there is even more habanero here. The burn is now within our mouth and the back of the throat. Marilyn feels the heat level is much higher than the Red Label, but since I’m writing this, I’m going with my take of only 1 notch up. Labels, graphics, bottles, packaging – it’s an ugly truth that they all play a role in our collective decisions to purchase a given product, especially when seen on a shelf in a store next to other products. 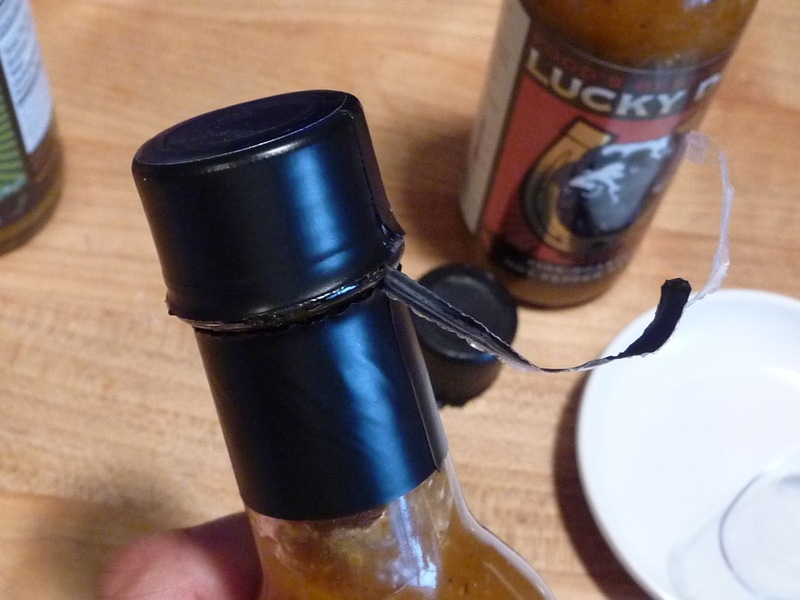 While this is not a deal breaker, especially when a given sauce has a stellar product inside but not so great labels or graphics outside, it definitely influences our purchases. Sometimes, however, the sauce speaks for itself. But as reviewers, we feel compelled to comment on such things. Bonus Points: Lucky Dog Sauces come with a high quality shrink wrapper that includes a built-in zip strip. 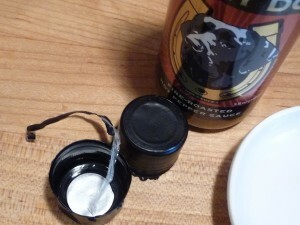 The shrink wrapper itself is of a thicker plastic than most, with a foil insert in the lid. The zip string goes around the neck for easy removal of the top. It’s reminiscent of the old wax-topped bottles with the fabric string. Very classy! Label/Graphics: All three flavors sport the same shiny metallic label. We’re not big fans of shiny labels. In my opinion, they are usually hard to read. But in this case, most of the sides of the label are easy to read – the ingredients, nutrition facts, and descriptive texts are all very visible. All three bottles also sport the exact same graphics on the front. They all show the same grayscale image of a dog, surrounded by the gold horseshoe. The distinguishing differences between the Green, Red, and Orange flavors and labels are the radiating … um… rays from behind the dog and horseshoe graphic. Regular readers know I’m color-blind, but even Marilyn agrees the green, red, and orange (I call it gold) rays are almost indistinguishable from each other; let alone when perched on a store shelf next to competing products. 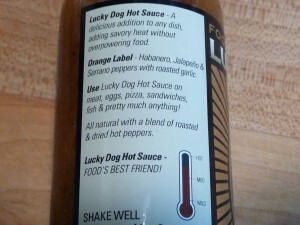 At first glance, I would not know there are 3 completely different flavors of Lucky Dog Hot Sauce. The only sure sign of the different sauces is on the side of the label. Printed there is text that tells you this is the “Green Label” with a short descriptive text of the peppers. The same goes for the “Red” and “Orange” versions. I would like to see something on the front label that tells me “this is the Green Mild, Red Medium, Orange Hot” versions of this sauce. Ok, I’ll stop with the graphics critique… let’s look at our final thoughts on these sauces. Red Label: – Our favorite of the 3 players here, the Red Label is very tasty, hot, and palatable. If you like your sauces on the mild to medium side, and want to venture into a really good habanero sauce, the Lucky Dog Red Label is a great start. It takes the heat level up just a notch. 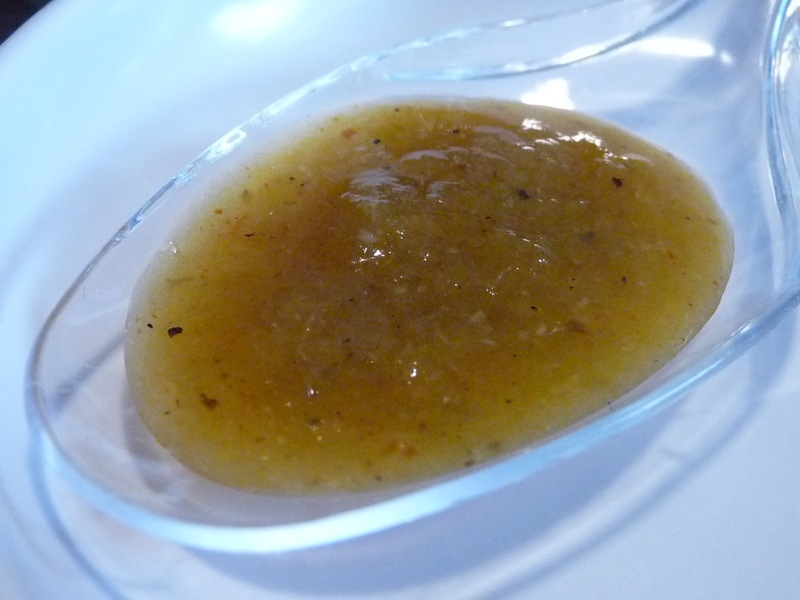 The habanero chile really shines here, with a nice balance of heat to sweet. Orange Label: – It’s hard to put into words, as I’ve just said the Red Label is our favorite, but the almost “umami” dark smoky flavor of this sauce is my personal favorite overall flavor profile of the 3 sauces. Unfortunately, the heat level was a bit too much for me for an everyday sauce, and so I can’t rate it higher than the Red Label. Marilyn agrees, the Orange Label is tasty, dark, and smoky, but was a bit too hot for her everyday tastes too. What a conundrum! 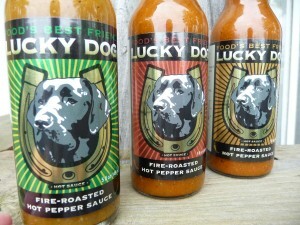 Lucky Dog Fire Roasted Hot Sauce sells for $4.99 per bottle, and is available at LuckyDogHotSauce.com. Get all three and save on shipping. Please leave a comment here, and then go over to ScottRobertsWeb.com and read his take on Lucky Dog Hot Sauces, and leave a comment there. Or vice versa. Great looking sauces! One of the things I love is family of sauces sharing a unified labeling approach… Nice job! Thanks so much for taking the time to review my sauces – I’m very glad you enjoyed them! One slight correction – I actually live in Hayward, CA and the sauce is manufactured in Sonoma, CA. I wish that I lived up there – it’s a beautiful area! Interesting that Scott Roberts is also releasing a review today – it’d been quite a while since I’d sent him sauce, so I’m like a kid in a candy store now. Excited to hear his take. Again, my thanks for taking the time to review. As a new company I can use all the exposure I can get and I’ll take 4-stars on a product any day! Woohoo! We planned it this way. Scott Roberts and I agreed to release our reviews the same day. As SR and I are usually in a bit of disagreement on a lot of sauces… I thought we’d have a little review battle going on here. But that’s not the case at all. We both had similar experiences and our comments across the board are unanimous. I think that’s a testament to the high quality flavors of Lucky Dog Sauces! Scott, I was not just satisfied, but thrilled to find that we shared a lot of the same opinions. Now if we could only get you to like Srirachi or Tabasco…. LOL! I just wanted to update to let you know that I’ve “re-launched” my company website! It is now located at http://www.luckydoghotsauce.com so the older links may not work. This site gives me the flexibility to put up some T-Shirts (limited) and a Lucky Dog Hot Sauce recipe page, currently being created by a friend who’s 1. a very talented and beautiful chef, and 2. a Lucky Dog Hot Sauce addict. Thanks again for all of your great feedback on my products! Maybe worthy of more than 3 stars? I guess the slight tweaks I made between your review & the Zestfest 2013 paid off!